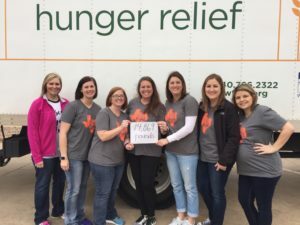 Food Fight is a one-day event where the Junior League of Wichita Falls, along with other Junior Leagues from across Texas and Oklahoma, compete to see who can raise the most food for their respective food bank through a Food Bank Challenge. Since the inaugural Food Fight, the Junior League of Wichita Falls has raised over 28,000 pounds of food. Our 4th annual Food Fight is scheduled for March 9, 2019 at United Market Street, 4590 Kell Blvd.